"The Class A Motorhome is a Vacation Home On Wheels"
They are literally houses on wheels and can have any option you want (for a price). In this section we will describe what's available and give you the pros and cons of the Class A Motorhome. The Class A RV is known by many names such as; Motor Home, Motorhome, Motor Coach, Motorcoach, Coach, Bus or Rig. We are sure that there might be other names out there, if we missed any, please Contact Us and we'll add them in. In this section we will discuss the following topics The Class A Sub-Types, How a Class A is built. Equipment that comes standard on a Class A. Optional Equipment Available and finally The Pros and Cons of a Class A. A passenger bus that is converted into a home on wheels. They gut the bus interior and add all the amenities you can think of to transform it into a livable space. Picture in your mind the classiest hotel suite you ever stayed in and you've got a pretty good idea of what to expect from a Bus Conversion. It is by far the most expensive Class A available. A new one can cost well over 1 million dollars. Quite a few NASCAR drivers and musical entertainers use these to travel the country in style to get to their races or concert appearances. Your key to shopping for a bus conversion is; "if you have to ask how much it costs, you probably can't afford it". If these are too pricey for you, your alternatives are to become a NASCAR driver, become a successful rock/country star or move on and start looking at motor homes you can afford. This a newer sub-category to the Class A Motorhome group. The diesel puller does not look so much like a bus, but more like a diesel truck. It has a truck front end. In fact there is debate if this is a Class A at all, some have said that these should be in the Class C group. We don't have the time or desire to get involved in this debate, so we put them here. With the two exceptions above, the Class A is built on a special chassis from truck manufacturers that are designed exclusively for Motorhome use. The bare chassis includes; the engine (diesel or gas), fuel tank, frame, transmission, axle assemblies, wheels, tires, braking system, instrument panel and steering assembly. They also throw in a folding chair so that the bare chassis can be safely driven to the Motorhome manufacturer. The Class A Motorhome manufacturer takes the bare frame and starts constructing the house. They add the tanks for fresh water, grey water and black water (all RVers have a love/hate relationship with the black water tank), they add the floors, the walls, the room slides, the appliances and furniture. Once they complete the interior they paint or coat the exterior. The completed Class A Motorhome can be anywhere from 25 to 45 feet long. The majority of the Motorhomes have one to six room slides, that can be opened up while camping to add additional living space. Pool Table (OK we just wanted to see if you were paying attention). 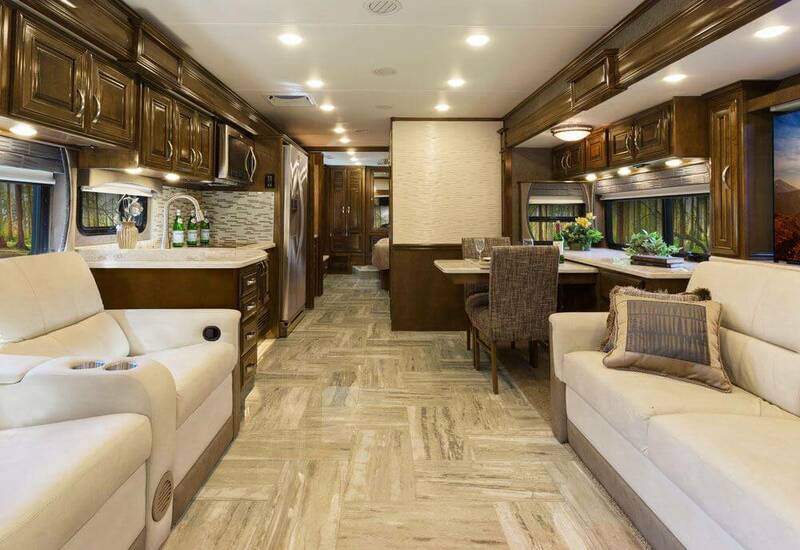 J The Class A Motorhome is the most luxurious of the motorized RV category. Remember the more luxurious it is the more money you are going to spend. J Lots of living space, the more room slides you have the more space you have. J You can use all the facilities and appliances while going down the road (not recommended if you are the driver). J Has the most optional equipment available. The more options you choose the more money you will spend (are you starting to see a trend here). J Because of the height of a Class A Motorhome, you get a much better view of the roadway and scenery. J The ride can be very smooth and quiet. (gas powered motor homes may be a bit noisier because the engine is located in the front). J The Class A Motorhome is ideal for the person who is planning to be a full-time (full timer) RVer . L The most expensive type of recreational vehicle. L Once your camp is set up, it is not easy to use a Class A Motor home for running errands and short site seeing trips. You either have to tow a vehicle with you or use the local transportation for the area that you are in. L Fuel mileage can be anywhere from 6 to 10 miles per gallon (your fuel mileage may vary). You must factor this in when considering which RV is right for you. L Not as maneuverable as your personal car or truck (this will become apparent to you the first time you end up at the end of a dead end street and realize you now have to back up for a mile). L When not in use a Class A Motorhome requires a large parking or storage area. If you have a long driveway and regulations in your area allow RVs to be parked in a residential driveway or street, you will be OK. If not, you will have to find an RV storage lot near you (which means spending more of your hard earned money). L Dependant on the length of your Motorhome, you will find that some campgrounds and RV Parks will not accept an RV over 35 feet in length (as time goes on this limitation is fading away). L Due to the higher profile of a Class A Motorhome, low branches and low bridges are a concern. You need to know the exact height of your vehicle when traveling, in particular on surface streets (otherwise you may end up with a new sunroof on your coach). Hopefully, the above information will be helpful in steering you in the right direction. If you have decided that a Class A Motorhome is the right type of RV for you, you should now head over to the Buying a RV section of this web site to get some more helpful hints.